The original French film, written and directed by Pascal Laugier, has attained cult status as one of the most grueling and upsetting of the recent era of horror cinema that nonetheless deserves critical plaudits—more Audition than A Serbian Film, in short. Laugier is a provocateur with a fondness for narrative twists coupled with weighty political and philosophical themes, as demonstrated (to solid but lesser effect) in both his debut House Of Voices and more recent English-language thriller The Tall Man. His Martyrs is in part an endurance test, a film that dares you to look away from its disgusting images even as it invites you to grapple with a story in which suffering plays a pivotal role. In reworking it for the no-subtitles English audience, that element of endurance is gone, and with it, the gut-punch of an ending which felt so earned is excised, in order to hurriedly wrap up a plot that now feels more trashy than weighty. The film opens on a young girl (Ever Prishkulnik) managing to escape what looks like a painful captivity in some abandoned building. Committed to a Catholic orphanage, young Lucy is befriended by a generous and open girl, Anna, who quickly realizes her quiet new friend is haunted by a monster, though whether real or imagined, Anna can’t say. Cut to 10 years later, when an idyllic-seeming family’s lazy morning is interrupted by a brutal invasion: It’s Lucy, now a young woman (ably played with an admirable fierceness by Pretty Little Liars star Troian Bellisario) and out for blood, convinced that the mother and father of this happy home are the ones responsible for her imprisonment as a child. After her attack, she contacts Anna, her old friend, to come help her take care of the situation—but when Anna arrives, it immediately becomes clear she’s less than convinced that Lucy, after all this time, actually found the right people. More importantly, it quickly becomes clear that whatever’s hunting Lucy isn’t going to be satisfied by the young woman’s blood offering. For all its violence, the first half of the film plays relatively conventionally, as far as horror narratives go. As in the original, the malevolent force that assaults Lucy is a traditional monster of sorts, though rendered less interesting (and much less horrifying) in this iteration by Scenic Route directors Kevin and Michael Goetz, who rely more on standard jump-scare tactics to goose the audience. (Though an early one, in a flashback to the orphanage, is effective.) Everything here is streamlined, and while it makes for a film better suited to short attention spans, it also lessens the impact, both of the scares and the overall mood. 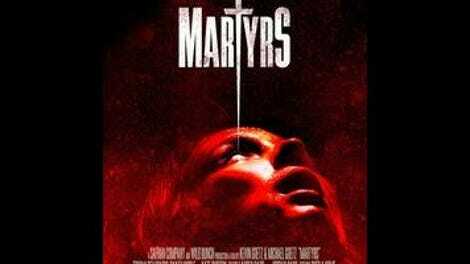 But the key element of Martyrs has always been the mid-point narrative shift, a profound one that completely redefines the film and takes it in a fascinating new direction, although one no less brutal than the first half. And to its credit, this is where the new Martyrs becomes more of a reimagining than a remake, as the plot is radically revised for the back end of the movie. Writer Mark Smith (Vacancy) has altered key aspects of the narrative, so that, while the destination is still essentially the same, the journey to get there follows a wholly different path. Suffice to say, it’s a rare case where scenes of painful violence suffer from brevity. The film takes an ugly ideal—one about sacrifice, violence, and the way people are willing to use others in the service of ultimately impossible goals—and does it a disservice by minimizing it in the interest of storytelling economy. When your movie is about the nasty business of physical suffering, trying to clean it up and put a happier (or at least less anguished) face on it ends up feeling like a cheat. The new Martyrs is a case of the whole being less than the sum of its parts, because the parts are a little too shiny, clean, and not built to last. The film gives off the impression that the audience should “enjoy” this experience. But some stories really shouldn’t leave you feeling satisfied. For thoughts on, and a place to discuss, plot details we can’t reveal in this review, visit Martyrs’ spoiler space.